The Marchesi family of Poschiavo, Switzerland. The Marchesi family of Poschiavo can trace its forbears back to the 16th century, in this beautiful little valley "between Switzerland, Italy and heaven!" I have assembled this website from my perspective as the grandson of emigrants from Poschiavo to England, and there will be many others in the wider family who will have histories to compile from their own points of view. 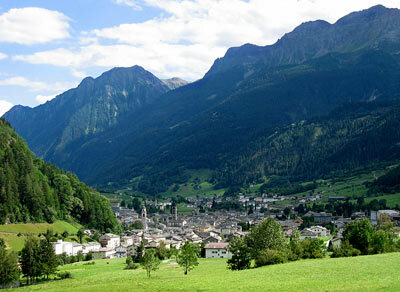 I claim no pre-eminence whatsoever, but my purpose is to provide information to those who are interested in our family history and ancestors who lived in this small town near the Italian border in Switzerland. My parents spoke constantly of Poschiavo and their Swiss relations, and my sisters and brothers feel a strong emotional bond with it. To us it is not only an attractive place, but the source of our family, and I have been fortunate to be able to go there many times. The information on this website has been gathered from many helpful sources, so what better than to share it! Any further contributions will be most welcome. La famiglia Marchesi di Poschiavo ha radici che risalgono fino al 16° secolo in questa meravigliosa valle “tra la Svizzera, l’Italia e il paradiso!”. Coloro che hanno la fortuna di visitare questi luoghi spinti dall’interesse per la storia della propria famiglia, spesso vi ritornano innumerevoli volte. I nostri genitori ci parlavano sovente delle loro famiglie e di Poschiavo, dimodoché le mie sorelle, i miei fratelli ed io sentiamo tuttora un forte legame emotivo con la valle. Per noi non si tratta semplicemente di un’amena località, ma del luogo di origine della nostra famiglia. Le informazioni presenti su questo sito web sono state raccolte da molte fonti rivelatesi di grande aiuto, quindi quale miglior modo di valorizzare le indicazioni ricevute che condividerle! Qualsiasi ulteriore informazione sarà caldamente apprezzata.